Coke’s summer gimmick of putting names and nouns on its bottles and cans is hokey, but it’s working, with the soda brand having appeased millions of Americans simply by slapping more than 250 popular names on its Share A Coke bottles. And people are having fun with it, taking pictures of their names, their friends names, and names they’ve never heard of. But no one, sadly, has used those names to remind everyone of Lou Bega’s “Mambo No. 5.” Until now, that is. A Reddit user posted a picture of seven Coke bottles bearing all the names—Monica, Erica, Rita, Tina, Sandra, Mary, and Jessica—Bega shouts out in the track. And while there’s absolutely a possibility (update: An actuality, even!) 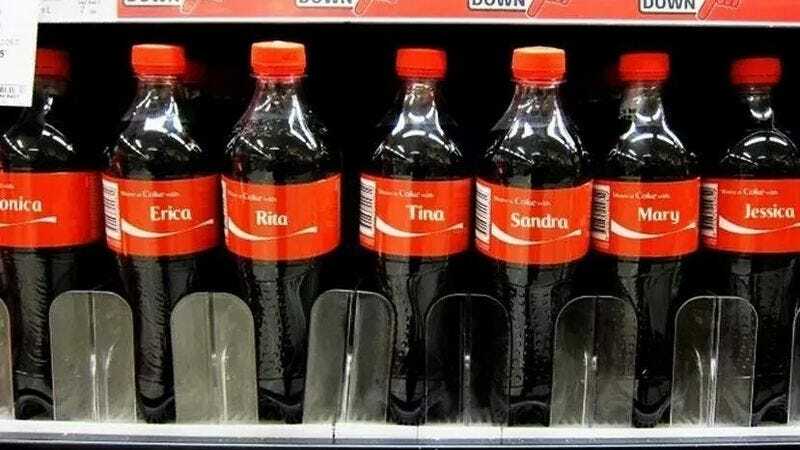 that this photo is ‘shopped and not entirely real, there’s also the possibility that it’s not, and that somewhere, in some sad convenience store, those bottles are awaiting a little bit of Lou Bega love.